There are two basic differences between passenger cars and SUVs. The first of which is a question of design: SUVs are constructed essentially the same way as passenger cars, except that they are generally heavier, and front or all wheel drive. The second difference is design intent. Passenger cars are designed to carry passengers over paved roads; SUVs are designed to traverse a variety of different terrains to transport passengers or cargo. These differences are reflected as much in their respective tire types as they are in other aspects of vehicle design. In general, SUV tires are of a larger and heavier construction than passenger car tires, with a knobbier tread pattern better suited to occasional off-roading than a passenger car's. Car tires are usually engineered to provide a comfortable ride over paved surfaces, and the tread pattern is specifically geared to siphon water away from the tire-to-road contact patches at speed. As a vehicle's wieght increases, it requires a harder rubber compound to withstand increased frictional wear. For instance, a 2000 lb. race car uses incredibly sticky rubber to grip the road for cornering, a tractor trailer uses concrete-hard rubber for long life, and the heaviest vehicles on the planet (trains) have metal wheels. There is a trade-off with using harder rubber compounds; since rubber depends on a certain amount of elasticity to grip the road, a harder compound gives less cornering grip and braking than a softer one. 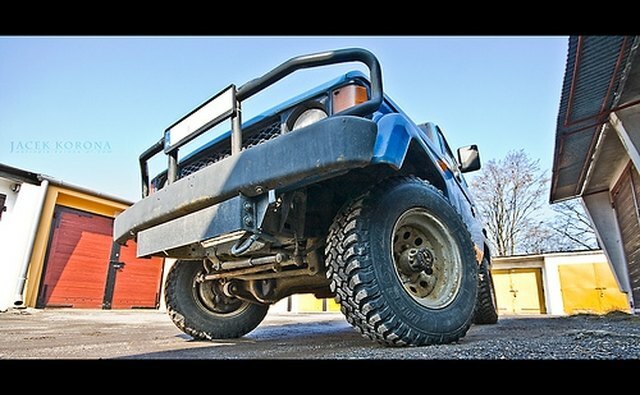 An SUV usually has taller sidewalls (the vertical part of the tire that connects the tread to the rim), which would flex a great deal more under cornering if all else were equal. To combat the effects of sidewall flex under the SUV's greater weight, tire engineers use thicker rubber in the tire sidewalls. Though thicker sidewalls would in and of themselves make for a harsher ride, the increased height of an SUV tire allows it to flex more under load, negating this effect. A passenger car's tires will usually have lateral grooves that are more swept-back than those of SUV tires. This allows more rubber to contact the road at any given point, increasing the tire's dry-road grip. SUV tires generally have more squared-off tread blocks to increase the pound-per-square-inch force where the tire contacts the ground. 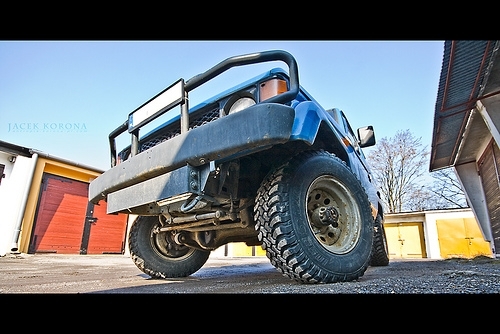 This allows SUV tires to dig into rough terrain for grip, as opposed to skating over the top like a car tire would. SUV tires will generally have a lower speed rating than their passenger car counterparts. According to BF Goodrich, this is due largely to the tire's knobby tread, which is less capable of dissipating the sustained heat of high speed than a car tire's larger tread blocks.